the 10 MAX Orange Line stations. The shelters are among a handful of add-back items that the Federal Transit Administration gave TriMet approval to install after the Portland-Milwaukie Light Rail Transit Project came in on time but under budget. 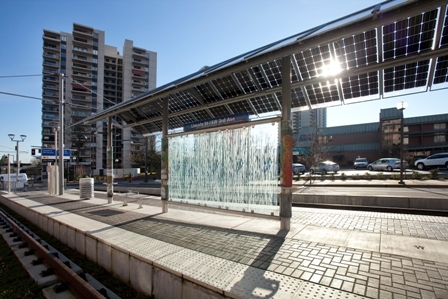 The shelters will feature the same rider amenities currently found at Orange Line station shelters, including flat screen arrival information, seating, security cameras and art features. Shelter installation gets underway Wednesday, Sept. 14 at the southern end of the Orange Line at the SE Park Ave Station in Oak Grove. Crews will work toward the Lincoln St/SW 3rd Ave Station in Downtown Portland. This Friday, Sept. 16, crews also are slated to start work at the Milwaukie/Main St Station in Downtown Milwaukie. Work at these two stations is expected to take about two months with three new shelters being installed at Park Ave and one shelter being installed at Milwaukie/Main St Station. There will be no impact to Orange Line service, but crews will close one access point at each station platform during construction, causing minor pedestrian detours around the work area. Most construction will take place during the day but some overnight work is required. Crews have to use a crane to set the shelter columns and canopy segments, which can only be done when MAX trains are not in service. Raimore Construction, LLC, a DBE-certified firm based in northeast Portland, is the prime contractor. Crews will range between three and five people, plus additional flagging and safety crews. The project construction cost is estimated at around $6.7 million. Learn more about TriMet’s DBE program.